It's said that we only go around once in life . . . at least that's the way it's always been. But what if? What if the terms of life have changed . . . for an elite, self-selected few? What if today's emerging bio-tech and regenerative medical technologies—including the ability to regrow and implant body parts and organs—offer the chance for another whole go-round in life to a select, secretive few . . . a chance to come back, as one of them puts it, into “healthy, horny 21-year old bodies complete with all our accumulated savvy from this lifetime”? What if the project is almost successful . . . but opens dangerous doors . . . doors that cannot be closed? A REMEDY FOR DEATH is fiction, but based on a great deal of keeping-up with what's happening in the various fields that make up what we know as bio-tech, regenerative medicine, and the role of the human mind. I'll be sharing some of that here on this blog, to which I'll be adding other items that I haven't yet posted . . . as well as news of discoveries to come. To view the book trailer "RADICAL LIFE EXTENSION and A REMEDY FOR DEATH"
Custom organs, printed to order. Nova Next, March 18, 2015. The method used in my medical techno-thriller, A REMEDY FOR DEATH, depends on human stem cells from adult donors (Induced Pluripotent Cells—IPS cells) rather than tissue from aborted fetuses--a topic very much in the news recently because of a series of videos. That said, an alternate research strand is very much in the news these days—fetal tissue research using organs from aborted fetuses. Reasonable people can—and most definitely do, strongly—disagree on the medical ethics not only of abortion but also of “organ harvesting” from the resulting fetus. The fields of bio-engineering, tissue engineering and regenerative medicine are moving very fast, and medical ethicists are struggling to keep apace. I expect you’ve heard about—and perhaps watched—the series of videos made by the Center for Medical Progress, an anti-abortion group recording interviews with Planned Parenthood staffers, as well as shots of the product of abortions induced in Planned Parenthood facilities. 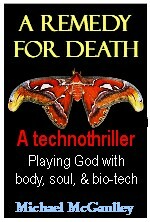 In A REMEDY FOR DEATH, I raised different but related issues involving bio-engineering, organ harvesting and other issues--different because the plot-line does not involve aborted fetuses. But it does touch upon some of the same issues of medical ethics and biological research ethics as are raised by these videos and resulting discussions. For an informative, balanced article on this issue of using aborted human fetal tissue in research, I suggest Sarah Kliff’s piece in VOX: "The Planned Parenthood controversy over aborted fetus body parts, explained"